treasurer; Rabbi Paul Plotkin, president; and Rabbi Kurt F.
all clear thinking people here. capital out of the situation. The words of Harold L.
nounced as they are finalized. hors' d'oeuvres and a cash bar. tman, Temple Bat Yam, Ft.
Meet the Rest of Your Family .. .
own elderly, our own survival. done, the final answer is yours. in China is shrouded in mystery. returned with spices and silk. who converted it to a mosque. history, rites, customs or holidays. time of the exodus from Egypt. milk and honey" (Num. 13:27). subjects and many varied topics. "voice" of our Women's Division. survival has often been difficult. gled through its birth and lived. that time, had our work cut out. or even many of the customs . would finally remain reunified . forever. The future looked secure. There was still much to do. has had to fight too many wars. She has lost too many people. pected problems at every turn. Yet, d'vash is also present. country will always be her people. abroad, as I have all of my life. How Will It Affect Jewry? being discriminated against because of its "ethnicity." pitfalls and greater opportunities for seeking punitive damages. buying, holding or selling property. earlier ruling. The case was then brought to the Supreme Court. didates. An appellate court had dismissed their suit. linear history where there has been none. (such as the ancient Israelites) and too little to others. a beginning, middle, and so far a happy ending." POSTMASTER: Sand addraas cnangaa to Tha Jewish FlorMtan. Jewish Federation ot Greater Fort Lauderdale Sheldon S. Polish, President; Kenneth B Blerman. Jewish Federation of Greater Fort Lauderdale, P.O. Box 28810. Tamarac. FL 333204810.
community may well be imagined. and gold and silver hues. memorial, in the year 1930." sioned the work to be done. increase over May of 1986.
many different jobs. For information contact 776-6000, ext. 4430.
on how you and your business can register, call 583-5437.
your kugel, he'll drop dead on the spot." in the face of almost certain defeat in the Senate. co-hosted a farewell reception for the group along with Rep.
cent Mary Rose Oaklar (D. Ohio) and Nick Rahall (D. W.Va.). rights treaties," the UCSJ said. over a building being torn down to make way for the U.S.
Engraving, which is being razed to make way for the museum. to Jess Hordes. ADL's associate Washington director. get the income you used to earn. Culture of the WZO, and Dr.
keep your tax advisor informed. with pure mountain water and nature^ sparkling effervescence. tions to family and work. But like every other time of life. the "golden years" are not all. ever undergo in our society. preparing for or functioning in. death of friends and loved ones. Alex Redhill to entertain them. ings sin ilcs to all with her Yiddish repertoire.of stories and song. HIAS Wants to Focus on You! that world Jewrv has to offer. Gently toss together all ingredients except ptgnoli nuts. the time to "Play-A-Day for UJA"
about to hide among the rocks. $ 's progress to date. own ranks, as cited above. stereotype in the public mind. unity of the Jewish people. company sold non-kosher meat under a kosher label in June 1985.
organizational and people skills required. ,The gift of Trees is perfect for weddings, births, Bar Mluvahs. A ring of 5 trees is only $25.A circle of lOtreesonly $50 . Crate carrot, or chop finely. those in need of social services,"
to accept it," cautions Mr.
to the provision of service. Mr.
cient and effective way possible. Adolph and Rose Lewis, JCC, Boca Raton. well in advance of the big event?" SATURDAY, July 18, 9 p.m.
come to JCC's TRIVIA NIGHT. on campus this past May 17.
ment of 35 different shop-keepers. located in front of Building "A,"
raising funds for the Center. Ruth's expertise for "Shuk '87"
was gained from good experience. pre-camp and post camp seasons. p.m. Trivia Night. Soref Hall. cheon and card party. Cost $6. panelli and Gina Wilson. Laud. West Rec. Center. Coast $4. Club: 8:30 p.m. Cabaret Night. A farewell party for "olim"
new life in the Jewish State. not always be "smooth sailing,"
Pearl, Ed Schulman, Mr. and Mrs.
Barbara Borf, Mr. and Mrs. The Court is managed by Palm Court . ity communities for over iW years. add The Court to your portfolio. ween 1/1,000 to 1/10 of a second. It's so good to hear . With joy forever pure! . So beautiful to say . a resistance to certain drugs. killed by the lightning trauma. In one case noted by Dr.
13 minutes with no vital signs,"
they appear to have been killed,"
hits, stay in the car to wait it out. Leonard Kaufman, Daniel Ballon and Rabbi Jeffrey Ballon. day 8 p.m.. Saturday 9 a.m., 5 p.m. Rabbi Avaron Drazin. Cantor Irvin Bell. TAMARAC JEWISH CENTER (721-7660), 9101 NW 57th St.. Tamarac, 33321. TEMPLE BETH ISRAEL (742-4040), 7100 W. Oakland Park Blvd., Sunrise. 33313. Saturday 8:45 a.m., 7:45 p.m. 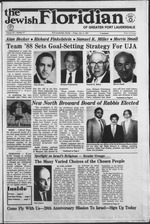 Rabbi Howard A. Addison, Cantor Maurice A. Neu. Blvd., Deerfield Beach, 33441. Sendees: Sunday through Friday 8:30 a.m., 5 p.m.
TEMPLE B'NAI MOSHE (942-5380), 1434 SE 3rd St., Pompano Beach. 33060. TEMPLE SHA'ARAY TZEDEK 741-0295). 4099 Pine Island Rd Sunrise, 33321. 8:45 a.m. Rabbi Israel Helpers. Friday at 6 p.m., Saturday at 8 a.m. Charles B. Frier. President. 8 a.m., 7 p.m., Saturday 8:45 a.m.. 7 p.m.
SYNAGOGUE OF INVERRARY CHABAD (748-1777). 4561 N. University Dr..
a.m., 5:30 p.m. Study groups: Men, Sundays following services; Women. YOUNG ISRAEL OF DEERFIELD BEACH (421-1367). 1880 W. Hillsooro Blvd..
Services: Friday 8 pjn. Cantor Richard Brown. Bat Mitzvah. Rabbi Jeffrey Ballon. Cantor Rite Shore. Creek Parkway Rabbi Brace S. Warshal. Cantor Barbara Roberts. York, NY 10022. 1986. 893 pages. order to prepare this book. or in the Jewish section of town. message. "The Staff of Elijah"
And it sounds so lovely,. Sang it so long ago. When they were children too. yeafs in the Holy Land. girl gave brith to a baby boy. the boy for his terrible behavior. were on their way to arrest them. they were putting up the building. completed his deeds on earth. a panorama of Jewish folktales. State of Israel Bonds. Pictured at top, from left. Dr. May; Prof.
Seymour Gerson, Prime Ministers Club chairman; Dr.
Mrs. Seymour Gerson, Mrs. Abraham Rosenberg, hostess. July 18, in Washington, D.C.
by sending a $10 deposit. of a Young Girl" by Anne Frank. the (Irace after Meals based? by Miep (lies. Simon and Shuster. helped to hide the Frank Family. satisfied and bless the Lord"
6- The prophecy of Obadiah. WRITE FOR YOUR 20 YEAR PERSONAL YAHRZEIT CALENDAR. INVESTIGATE OUR PRE NEED FUNERAL ARRANGEMENTS THROUGH THE "ASSURED PLAN"
and currently has 51 members. and currently has 78 members. based on the Calloway system. Report JAN. '85; BOX 100s: Less than 0.5 mg. "tar;' less than 0.05 mg.
nicotine, SOFT PACK 100s FILTER, MENTHOL: 3 mg. "tar;' 0.3 mg.